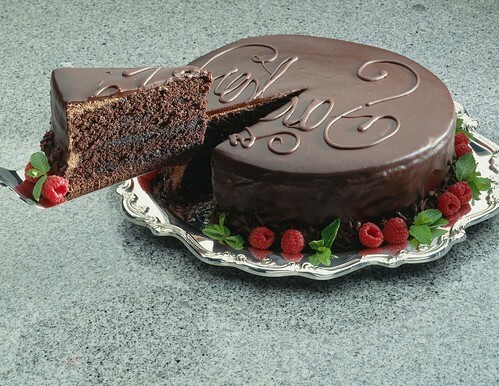 This chocolate cake may not devastate you, but it will enrich your life with its decadence. Your friends, with whom you decide to be the most generous of persons, and share a piece (or a bite?) with are likely be grateful for some time. This cake may well become a stand-by for parties, friend’s birthdays, and those cold winter days when chocolate cake and a cup of tea (or beer or wine) is what you are craving. Preheat oven to 350 F. Sift dry ingredients into a large bowl and mix thoroughly. Mix wet ingredients in a blender until no lumps of tofu remain. Pour wet ingredients into dry bowl. Fold together, do not over mix. Pour batter into lightly oiled and floured 9 inch spring form cake tin. Bake for 40 + – minutes, checking with a toothpick to ensure it is cooked throughout. Allow to cool before icing.